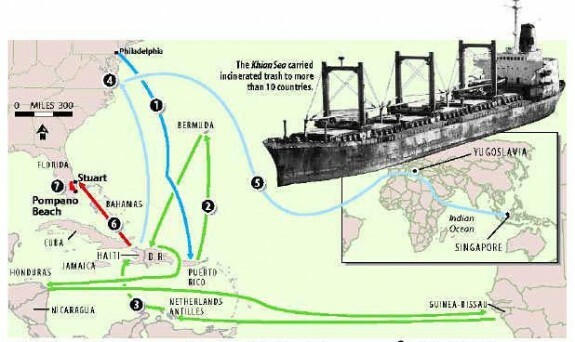 Starting in late 1986, tracking the meanderings of the Philadelphia waste ash aboard the freighter Khian Sea became widespread in the U.S. media, and the attention grew as the voyage went on for years. This mapping of the freighter's route in its effort to dispose of the 15,000 tons of ash appeared in the Ft. Lauderdale Sun-Sentinel in January 2001, fifteen years after the journey began. By this time, most of the ash had disappeared into the ocean on a leg between Yugoslavia and Singapore and the Khian Sea had been scrapped (in 1992). Early in the ill-fated disposal cruise, a few thousand tons of the ash had been dumped in Haiti. Years later much of that ash was transported to Florida by another ship, which in 2000 offloaded it into a barge docked in the St. Lucie River at Stuart, Florida, and it seemed the ash would be buried at a landfill near Pompano Beach. That was the plan at the time this graphic was published, but a public outcry scuttled that. In the spring of 2002, the ash was shipped by rail to Hagerstown, Maryland, and then trucked to the Mountain View Reclamation landfill in south-central Pennsylvania, its final resting place. Here is the key to the routes marked on the map, which was published on January 26, 2001. 1. Sept. 5, 1986. The Khian Sea leaves Philadelphia for the Bahamas with 14,355 tons of incinerator ash. 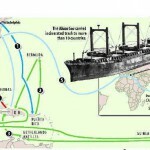 Officials in the Bahamas reject the shipment before it arrives, forcing the ship to change course. 2. Sept. 1986-Aug. 1987. The barge is turned away from Puerto Rico, Bermuda, the Dominican Republic, Honduras, Guinea-Bissau and the Netherlands Antilles. 3. Dec. 1987-Feb. 1988. The ship arrives near Gonaives, Haiti. The crew unloads about 4,000 tons of ash officially described as "soil fertilizer" before being stopped. The government orders them to reload and depart, but they leave the ash on the beach. 4. March 1, 1988. The Khian Sea arrives in Delaware Bay to return the remaining ash, but is rejected. The ship leaves for Africa. 5. Aug.-Nov. 1988. The ship, renamed Felicia, appears in Yugoslavia for repairs and is escorted away. It reappears near Singapore with a third name, Pelicano, but no ash. The captain testifies that it was dumped in the Atlantic and Indian oceans. 6. Spring 2000. The ash left in Haiti is picked up and brought to Stuart, Florida. It sits in the St. Lucie River until a home is found. 7. Thursday. The state agrees to bury the ash in the landfill near Pompano Beach. 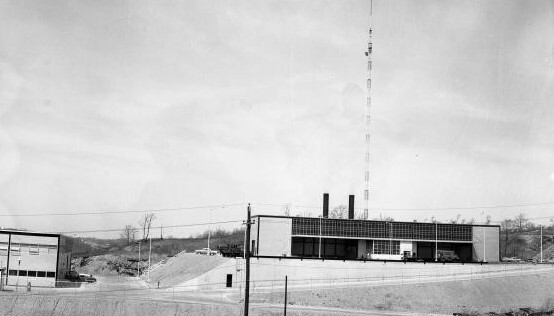 The 15,000 tons of ash that was loaded onto the Khian Sea in 1986 started its journey at this plant, known as the Northwest Incinerator, located in the Roxborough section. 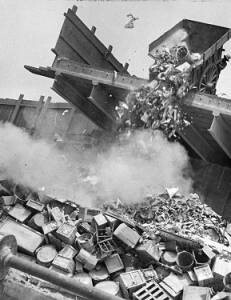 The Northwest Incinerator had been turning the city’s trash into ash since the 1960s. After the trash was turned to ash it was dumped on the land surrounding the incinerator until it could be trucked to a landfill. This worked until the Kinsley Landfill in Gloucester County, New Jersey, which accepted a large part of Philadelphia's ash, was closed to outside users. Then the city contracted with a private waste-removal company to ship the ash to the Bahamas. 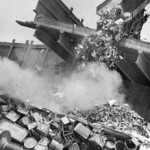 Philadelphia had a long history of using ships to dispose of garbage, as in this 1937 photograph of trash being dumped into a riverfront garbage barge, which then carried its load away from the city and dumped it in the river. Over time, the city began using landfills instead. 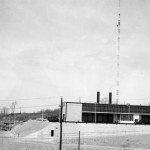 In the early 1980s, the City of Philadelphia disposed of some of its trash at the Kinsley Landfill in Gloucester County, New Jersey. In 1984, however, Gloucester County blocked outside users from the landfill, leading the city to put 15,000 tons of incinerated trash onto an ocean-going ship called the Khian Sea. The ship was supposed to dump its cargo in the Bahamas during the late summer of 1986, but the Khian Sea and its cargo ran into many difficulties as port after port refused to accept the cargo. Philadelphia’s disposal problem began in 1984 after Gloucester County, New Jersey, blocked outside dumping from its Kinsley Landfill, which had been taking more than forty percent of the city’s trash. Ash from Philadelphia’s two municipal incinerators started piling up after another landfill, near Baltimore, failed to meet Maryland environmental standards and closed. When Philadelphia loaded the ash aboard the Khian Sea, it was to be taken to the Bahamas and used as fill. Before the ship reached its destination, however, concerns raised by environmental groups about the toxicity of the ash scotched the plan. With the ash still aboard, the Khian Sea embarked on a two-year journey across eleven countries and four continents. The ship was turned away at gunpoint at two ports, the crew almost mutinied, and its engineer threatened to scuttle the vessel and was also tossed into jail. Ultimately, the Khian Sea dumped more than 2,000 tons in the remote Haitian port of Gonaives before being ordered out of that country. When the ship, renamed the Felicia in the hope of escaping the Khian Sea’s notoriety, arrived in Singapore in November 1988, its cargo had mysteriously disappeared. The pariah ship changed its name several more times–to the Pelicano, then the San Antonio–by the time it was detained by federal officials in October 1989. In a 1993 federal court case the ship’s captain, Arturo Fuentes, testified that the crew used a front-end loader to dump the ash from Philadelphia overboard, part of it in the Atlantic Ocean and part in the Indian Ocean. Two Annapolis, Maryland, businessmen, who operated the ship, were convicted of perjury for lying to a grand jury investigating the case and went to jail. The local firm contracted by Philadelphia to haul the ash, Joseph Paolino & Sons, which had been blocked from disposing of the waste in landfills in West Virginia and South Carolina before turning to the Khian Sea, was eventually acquired by Waste Management Inc. of Houston, Texas. Waste Management repatriated the last remnant of the Khian Sea’s cargo–the ash pile in Gonaives, Haiti. The federal Environmental Protection Agency and the Pennsylvania Department of Environmental Resources both tested the ash pile and ruled it non-hazardous. The 2,345 tons of ash were moved to a hopper barge in Stuart, Florida, and sat there for two years. When it appeared that a Waste Management landfill in Louisiana might be the ash’s final resting place, the Louisiana Senate passed a resolution, 25-1, calling for banning the ash from the state. In the spring of 2002, the ash was shipped by rail to Hagerstown, Maryland, and then trucked to the Mountain View Reclamation landfill in south-central Pennsylvania. “There is no happy ending to the story,” said Lisa Finaldi, national coordinator the toxic campaign of the environmental group Greenpeace. “Hopefully there was a lesson learned from this and we can do better at managing household waste in this country.” Philadelphia taxpayers never had to pay the $630,000 to dispose of the ash because the contract required it to be disposed of legally. By 1990, Philadelphia had closed its municipal incinerators and instituted a citywide recycling program to cut the volume of landfill waste. In response to the tight market, new landfill capacity opened in Pennsylvania easing the city’s problems. Among big cities Philadelphia’s problem was not unique. After New York City closed its Fresh Kills Landfill in 2001, it had to ship its solid waste to landfills in Pennsylvania, Ohio, Virginia, and South Carolina. While Philadelphia did find places to put its trash, the costs of disposal between 2000 and 2014 doubled to $140 per ton and was projected to reach a total of of $367 million a year by 2016. Benton-Short, Lisa, and John Rennie Short. Cities and Nature. New York: Routledge, 2013. Black, Brian C., and Michael J. Chiarappa, eds. Nature’s Entrepot: Philadelphia’s Urban Sphere and Its Environmental Thresholds. Pittsburgh: University of Pittsburg Press, 2012. Zimring, Carl A., and William L. Rathje, eds. Encyclopedia of Consumption and Waste: The Social Science of Garbage. Thousand Oaks, Calif: SAGE Publications, 2012. In the News: Khian Sea, archived on Philly.com. It’s interesting to learn that in the past, waste from Philadelphia was been disposed by loading it on a barge to be transported to the Bahamas. It is no surprise that many environmentalists were unhappy about this method. It seems like a creative idea to use resources to transport waste for disposal when alternative methods are not an option.